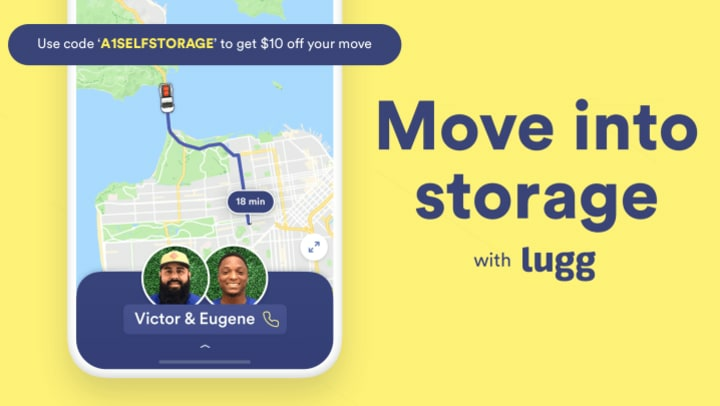 A-1 Self Storage is proud to announce our newest partnership with Lugg, a moving service that will connect you with two movers and a truck to move your items. Now, when you are moving into or out of your storage unit, you can sit back, relax, and request a Lugg to move your items for you. To access Lugg, you can download the “Lugg” app or visit their website at lugg.com. To request a Lugg, you will be prompted to set your pick up address, destination, and add a photo or description of your items to be moved. The service may be requested anywhere from 30 minutes to 30 days in advance. You will receive a text confirmation as soon as they are on their way. Lugg will then pick up and deliver your items to your destination. Once you are happy with where your items are placed, you will be charged and given the option to tip and rate your experience. How Much Does Lugg Cost? The price is dependent on your vehicle of choice, miles driven, and time spent loading and unloading (not how many items you have). Free estimates are available. Don’t forget about our promo code! Use code “A1SELFSTORAGE” to receive $10 off! Just enter our code at the bottom of the final screen before you schedule. What Can I have Lugg Move? Lugg offers four different moving trucks dependent on the amount and size of the items you need to move. They will even move appliance like refrigerators, washers, and dryers. Lugg Lite will connect you with one mover and a pickup truck. Lugg Pickup will connect you with two movers and a pickup truck. Lugg Van will connect you with two movers and a medium van. Lugg XL will connect you with two movers and a large van. How Do I Prepare for Lugg Movers? All you need to do is disassemble and pack your items accordingly. Lugg’s movers will move your items from your home or business to the storage unit safely using blankets and other protective materials for your items while on the move. They will bring your items inside and stay until you are happy with the placement. Do I Need to be Present When Lugg Arrives at My Storage Unit? We do require you to be present when Lugg is delivering or picking up your items to ensure your safety and privacy. Only you have the keys to your unit. Is My Area Covered by Lugg? Lugg is available in all areas surrounding our current locations. The Luggers are Lugg’s movers who undergo a thorough background check, are 21 years old or older, and tested to carry at least 100lbs with furniture moving experience, so you can trust your items are in good hands. The stress of lifting heaving boxes and transporting large appliances has finally come to an end. Lugg will comfort you with the ease of moving in and out of your storage unit and we are very excited to partner with them to offer you this convenient service. All you need to do is pack your items accordingly, order a Lugg and meet them at your unit! If you have any additional questions please do not hesitate to reach out to one of our friendly leasing offices.